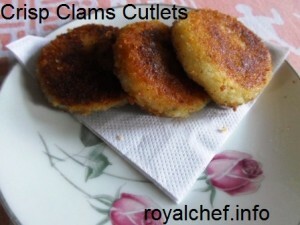 This is a simple to understand step-by-step Recipe for preparing at home crisp and spicy Maharashtrian Style Clams Cutlets. These tasty Clams Cutlets, which are a specialty of Konkan and the neighboring Goa, are known as Tisrya Mule Cutlets in the Marathi language. The Clams Cutlets are usually eaten with Amti-Rice and also taste great with Chapattis; they can also be served as a starters item for any kind of parties. Khubbe or Kalva, which are also from the Clams family, can also be used instead of Tisrya Mule to prepare these Cutlets. Clean the Clams, remove the flesh from shells, and cook it slightly. Boil and grate the Potato. Chop the Onion, Ginger-Garlic, Green Chilies and Coriander. 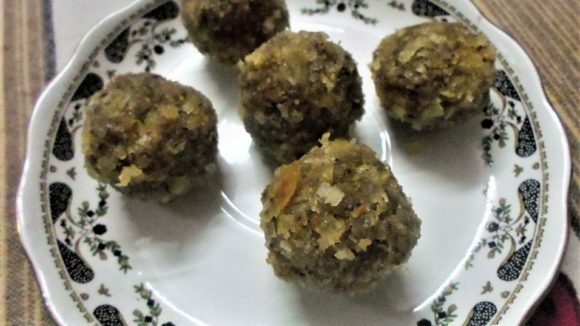 In a big sized bowl mix the flesh of the Clams, grated Potato, Coconut, Ginger-Garlic, Green Chilies, Suji, Maida, Coriander Leaves, Cinnamon Powder, Lemon Juice, and Salt nicely, prepare a12 small sized balls, and flatten them in the center. Then roll the balls into the Suji. Heat the frying pan, apply the Oil all over the Pan, arrange the Cutlets over the frying pan, and add some Oil over the Cutlet and shallow fry the Cutlets from the both sides until they get nicely browned and crispy.